The US East Coast is experiencing an “old-fashioned” winter, with plenty of cold weather and some heavy snowfall in certain places. 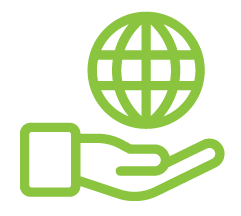 Listening to climate contrarians like President Donald Trump, you might think this constitutes the death knell for concern over human-caused climate change. Yet, what we were witnessing play out is in fact very much consistent with our expectations of the response of weather dynamics to human-caused climate change. Let’s start with the record five-plus feet of snowfall accumulation in Erie, Pennsylvania, in late December. Does this disprove global warming? “Exactly the opposite,” explains my colleague, Dr. Katharine Hayhoe of Texas Tech University. Global warming is leading to later freeze-up of the Great Lakes and warmer lake temperatures. 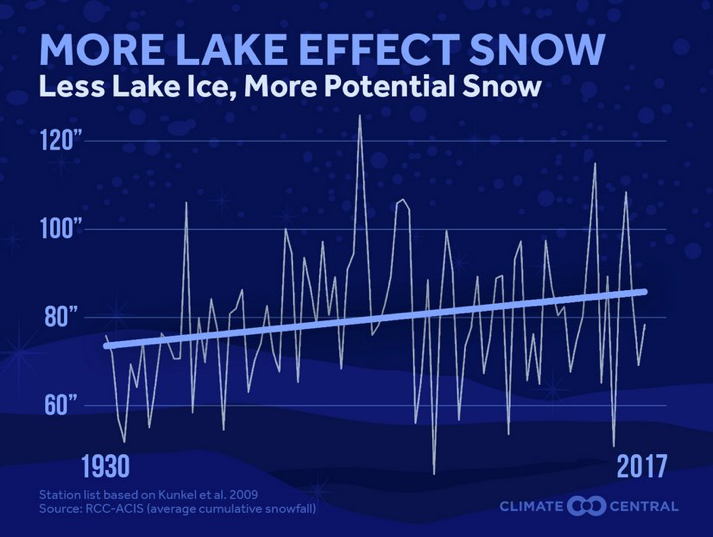 It is the collision of cold Arctic air with relatively warm unfrozen lake water in early winter that causes lake effect snows in the first place. The warmer those lake temperatures, the more moisture in the air, and the greater potential for lake effect snows. Not surprisingly, we see a long-term increase in lake effect snowfalls as temperatures have warmed during the last century (see figure below). How about those frigid low temperatures back east this winter? Surely that extreme cold must disprove global warming? Once again, the claim is misguided. While we have seen some daily all-time lows for a smattering of locations in the US, these pale in comparison with the number of all-time highs we’ve seen over the past year. In fact, the record highs have outpaced the record lows 61 to seven, i.e. nine times more often (see table below), consistent with what we expect to see as the globe continues to warm. Moreover, while we’ve seen some cold weather in the eastern half of the North America (see the pattern for New Year’s Day below), the western half of North America has been unusually warm. 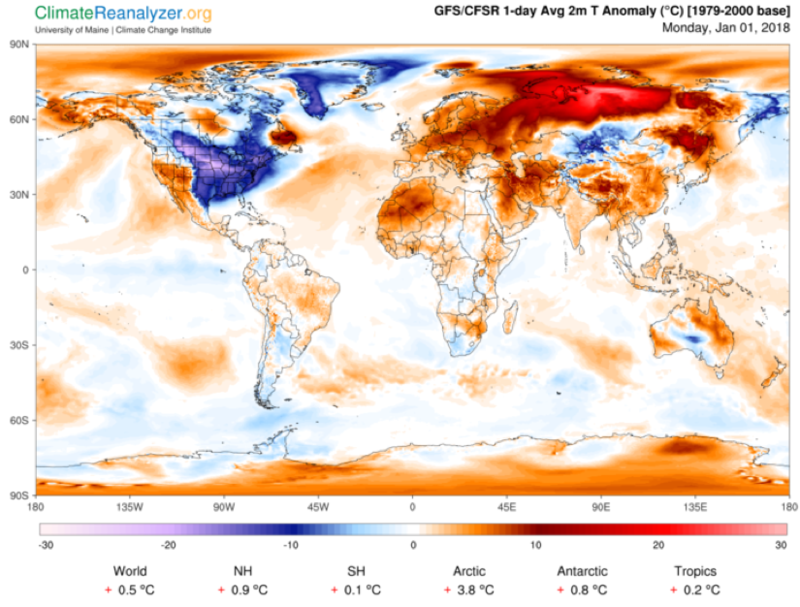 Indeed, most of the Northern Hemisphere, and the globe overall, have been unusually warm. That’s why we call it global warming, folks. But what about this pattern of cold in the eastern US and warm in the western US? This so-called “dipole” pattern has become more common in recent winters, and recent research suggests that climate change may be favoring this contrast in temperature by causing the jet stream to meander in a particular pattern, with an upward meander or “ridge” in the west bringing warm air up from the south and a downward meander or “trough” in the east, bringing cold air down from the north. Some scientists think that the dramatic loss of sea ice in the Arctic may be favoring this jet stream pattern. 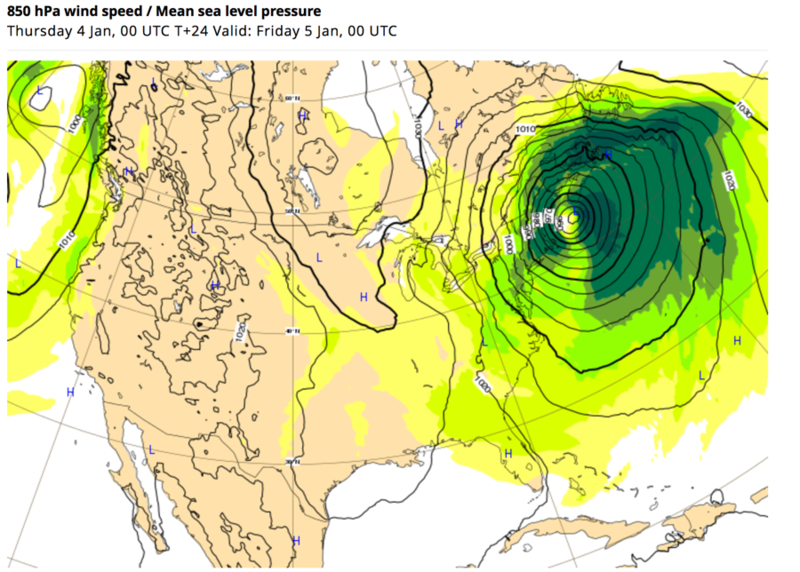 With a central pressure forecast to drop very low (see plot below), the storm will threaten the record set by unprecedented 2012 Superstorm Sandy as the lowest surface pressure ever measured in the North Atlantic north of Cape Hatteras (the central surface pressure of a storm is one measure of its strength). Surely such a massive winter storm, with its promise of bitter cold winds and potentially heavy coastal snowfalls, must be evidence against the climate crisis? Once again, rather the opposite is true. East Coast winter storms, known as “nor’easters” because of the unusual northeasterly direction of the winds as the storm spirals in from the south, are unusual in that they derive their energy not just from large contrasts in temperature that drive most extratropical storm systems, but also from the energy released when water evaporates from the (relatively warm) ocean surface into the atmosphere. This is a characteristic that these storms share with tropical storms and hurricanes. The warmer the ocean surface, the more energy that is available to intensify these storms. And the warmer the ocean surface, the more moisture there is in the atmosphere – moisture that is available to form precipitation. As the winds wrap around in a counter-clockwise manner, they bring all of that moisture northwest, where it is chilled and ultimately falls not as rain but snow. Lots of snow. 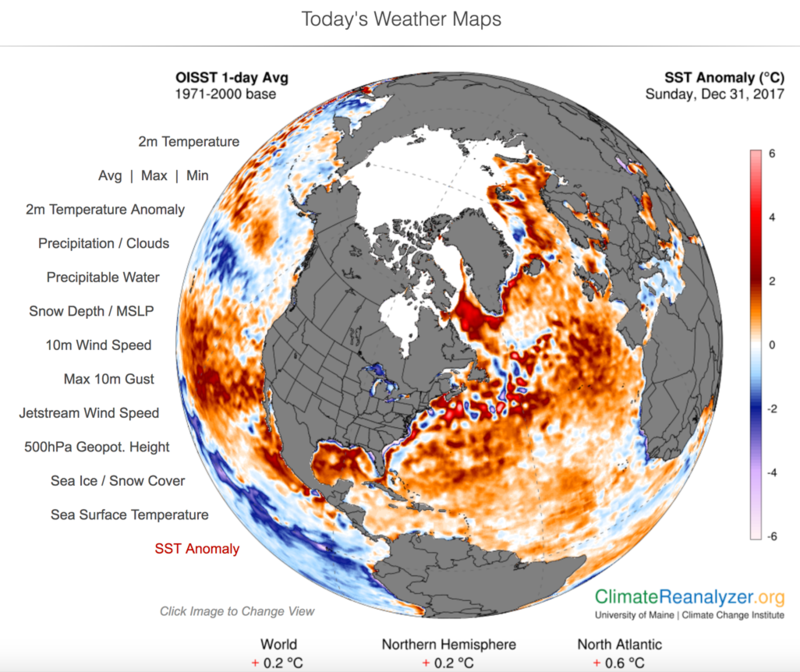 As the oceans continue to warm, cold Arctic air masses collide with increasingly warm Atlantic Ocean waters. That means larger temperature contrasts and potentially stronger storms. But those warmer oceans also mean more moisture in the atmosphere, even more energy to strengthen the storm, and the potential for larger snowfalls. We might, if you’ll forgive the pun, call this a “perfect storm” of factors for intensification. Indeed, climate model simulations indicate that we can expect more intense nor’easters as human-caused climate change continues to warm the oceans. This leads us back to the current strengthening storm. The entire North Atlantic is unusually warm right now (+0.6 degrees Celsius) relative to the already-globally-warmed late twentieth century (1971-2000) average, and there are large patches of ocean water off the US East Coast that are 2-4 degrees Celsius above that average. The storm will be encountering that exceptional ocean heat as it travels northward along the US coastline, and that is part of why it has a very good chance of becoming the most intense nor’easter we’ve yet observed. 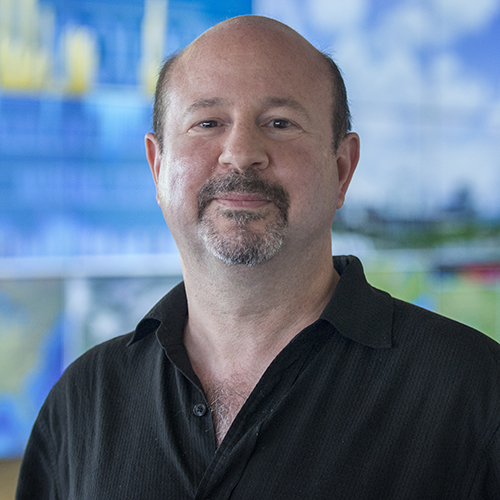 Dr. Michael Mann is distinguished professor of atmospheric science at Penn State University and author of The Hockey Stick and The Climate Wars and, more recently, The Madhouse Effect.